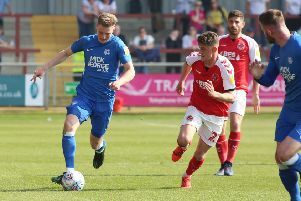 For the second game in a row Peterborough United suffered from having too many players off form at Scunthorpe today (April 3). Scunthorpe won the League One match 2-0 and here are the player verdicts as written by Peterborough Telegraph Posh writer Alan Swann. Luke Williams: Drifted in and out of the game in the first-half before disappearing altogether in the second-half. Looks like he wants to drop off the front to collect the ball, but this team isn’t playing in that way. A rather strange and ineffectual full debut 4.